OK! Here are some random pictures that I've been wanting to show all of you. I haven't taken a good picture of the Speck ring yet, but I'll get that on here soon. This is Chuckanucka. He is an "uglydoll" and is blessed to be my first toy purchase for Spudkin. I've always sort of like these uglydolls, and then Rib and I discovered Chuckanucka. A while ago I started calling Brendan "Chuckanuck." I don't remember how it came about, but there you go. So, naturally when we discovered Chuckanucka, I knew I had to get him. He came with a little story that describes how he's always anxious and worried about things... that'll be fun. I'm hoping that maybe Spud will tell me what he/she's concerned or thinking about on her own, but if I can't get it out... maybe she'll tell me what chuckanucka is stressed about :) And, it's cute. Brendan already made me cry because the day that our fire alarm went off in the building Brendan told me that I better check on Chuckanucka because he was worried that it was his fault and there weren't any grownups home to take care of him! So mean to do to a pregnant lady! Of course, reality occured to me pretty quick... he's not real! I don't want Spud to have tons of toys, but I just had to get this. In honor of Nathan's upcoming birthday (same day as my mom's! 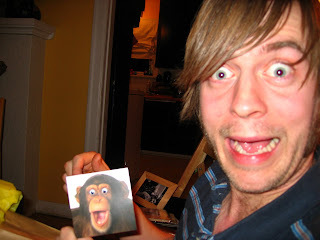 ), here's a picture of him with his card from us at the last birthday. Wish I could be with all my February 1st birthday friends this year! Yeah, I graduated. I don't know if many people have seen any of these pictures. This was the worst day of my miscarriage, so I think I look a little piqued. Still, I'm thankful that I have my degree. I've wanted to put this up for a long time! This is Kelsie and me at the last gypsy party. We were the only ones dancing for a little while, so we decided to sport some of the old moves! This one's for you, Beth! We're doing your knee swivel dance! Spud's in there. Sorry it's sideways!!! I'm terrible at rotating these... cuz I don't know how. I'm inept b/c Brendan always does everything for me, but I'm not complaining. Anyway, this is the beginning of week 17. I'm halfway through 18 right now. Notice my bird painting in the background; Brendan got that for me back in September. It's our first "real" art purchase. A close-up of the belly. This is the wreath I made at Christmas with grapevines from the Ribera Sr.'s back yard. Hope you enjoyed. I wish I was better about pictures; maybe I'll try. While I am mostly happy to not have to schlep down to Burien and endure 4.5 hours of torture on my L5-SI disc, I'm also somewhat sad to lack any form of gainful employment. It really sent me into a funk yesterday. At first I thought it was just because now I feel a little lazy and worthless. Of course, I know that I'm still doing the important job of Spud cultivation, and that is just about the most worthwhile thing I've ever done. Brendan also set me right by asking, "Do you want me to get a lesser-paying job so that you have to work?" To which I answered, quite sagely, I might add, "NO." I have to correct my perspective on worthwhile activity. I do a lot of things that I don't get paid for that are still very good and necessary things to do like arranging church activities, being hospitable, taking care of Rib, and taking care of the baby incubator that is me. I think I just don't want people to look at me like I'm not worth my salt. I also was dealing with some wrapping-up of my involvement in the business I started and then decided to drop (which was a good choice, by the way). If you've ever thought filling out a 1040 was hard... try doing a 1065; it's doable, but it takes a lot of work and sifting through what applies to you and what doesn't. The instructions are 41 pages long. It was weird to be working on the final pieces of ending that "job" while I received the news that I didn't need to teach anymore. It felt like I wasn't seeing things through. I'm worried about the progress of my students now that I'm not going to be their teacher, but that's just sort of weird and controlling. I guess I also worry about the business as it moves forward because I invested a lot of time and work in that too. But, I know it's in good hands, and it was a good experience. Still, it was a strange combo of emotions. Then, last night we watched Once which was a beautiful, simple, short film about 2 musicians who help each other navigate the crossroads in each other's life. The singing and playing was so beautiful. During the scene when they first sing together, the real root of what was bothering me about the events of my own life yesterday occurred to me. Here were these two people who (in imaginary movie land; I know), knowing the extent of their own abilities and talents, had the confidence to just sit down and sing and play together. That is the best feeling: to know that you're good at what you do and to know that you can pull out your talent at any time and trust that it will be in the state that you left it. That's how teaching had been for me. I was a very talented dancer, certainly not the best or maybe even among the best, but I was good and had potential out the ying-yang (lovely). I had confidence in explaining any step or nuance of ballet to my students; I even had confidence in my ability to show them what things are supposed to look like, busted and old as I am. I also had finally reached the place where I was taking complete joy in teaching ballet and rarely thinking about what I was missing in no longer being able to perform as I once could. I'm sad to not have that. Now, I have to stuff that talent away again. It had to be dormant for so long, and it finally was getting to stretch its legs. Back in your box; back where I don't like to think about you because it's just too hard. Maybe I'll pull you out again someday, but we'll see. I guess I was feeling the same way about all the different projects I've been through in the last year, mostly the business and art night. I was good at school, at my major especially. I know how to coordinate and plan. But, now, I'm not exercising my business talents... well, I am for the next 2 months or so until the taxes are finished. We have another art night coming up at church, and I'm marginally involved. I feel like I got this big thing going again and had a chance to be involved in the art world, even if it's not my particular area of expertise, while also using the skills and talents I honed in the Business School. I barely have a bit part this time, and that was my choice. I can't be on my feet or even be awake as much as I had to be to pull off the last one, so there was no way I could have been in charge again without being constantly worried about my and Spud's health. I've always been such an overachiever that this not having an outlet for any of my skills thing is hard. God is so wise though. Life is not supposed to be about me exercising my talents. It just isn't, and I know that. So, I'm sure that having no chances to delude myself that that is what it's about is good for me. I don't think that I ever consciously make my jobs and talents the root of my confidence, but the degree to which I've been shaken by the removal of those opportunities proves to me that my priorities have got to be at least a little out of whack. And, I am very excited to just focus on preparing for being Spud's mommy. I definitely have a giant stack of books to read! The whole moving thing will be upon me quicker than I want it to be anyway, so it's probably good that I have lots of time to organize and clean everything about the apartment. I'll have to avoid procrastination! I'm hoping that this week will be nice and calm. I somehow manage to keep too busy despite only having a 4-6 hour a week job! I'm not teaching this week because we have our congregational meeting at church tonight, and I hate to miss those. But, I already have 4 out of the 5 weeknights full this week. It's amazing what a homebody I've become. I need to have a week with NO plans soon! I guess I'm feeling the need to stay home because this last weekend was particularly busy. Spud attended his/her (can't wait until I don't have to write that anymore!) first youth group lock-in on Friday. Don't worry; I didn't stay all night! On Saturday, we picked up the Speck ring. I like it a lot. I'll post a bunch of pictures soon. I'm just too lazy to do all the computer switching that picture posting requires around here. Then, I spent the day with Lola. We got manicures at this awesome salon called Julep that's new in town. It was incredibly nice and fancy, and it only cost $8 more than your average manicure at a slightly sketchy, are-you-sure-you-understand-what-I-want, reeks of acetone salon. Then we met up with the boys for dinner at a new restaurant at new village that was pretty good but not totally worth the cost. On Sunday, we had 9 grownups and one 2 year old over for a lunch of pulled pork. So good. That was, of course, great, but everything makes me so tired these days, especially if I can't get a little nap. Rib is home today. It snowed last night, and Seattle, of course, fell apart! It's not even bad outside, but the poor boy's 2nd bus never showed up. So, he just came back to work from home. Just as well, I guess, because I didn't want to have to drive up the hill tonight if it snowed more to pick him up for the meeting. This is the day that Speck was due, and I really have no idea what to do with myself. I had planned to maybe try to do some painting or something, but I am having trouble deciding on a way to paint about all this. I definitely will do more writing after this post in my little book of letters to the babies. I don't write to Speck anymore because that seems a little creepy. Sort of like praying to a person, and that would obviously be wrong and a little Catholic, actually. But, I like writing to Spud about Speck sometimes because I am able to love Spud more and be more thankful for him/her because of Speck. So, that's one thing on the list of things to do. I'm usually really good at making lists, but today I'm sort of at a loss. I suppose that may be part of the problem. I always want to DO something; it feels like some sort of way to purge all the thinking and feeling. After Speck left, I instantly filled my plate with 5 jobs. Yeah, I had 5 jobs for a while there. Of course, that sort of was reactionary and didn't serve me very well. It also kept me from being able to appropriately process and grieve because I was too busy taking care of everyone else all the time. It got to the point where I would just start crying at random times and not be able to stop: while babysitting, while organizing someone's files, while planning long-term vision, while making earrings, while grocery shopping, while teaching. Yeah, that was no good. So, doing is not always the right thing to do. I've learned that lesson, I think. I'm down to one job :) Well, one that I get paid to do. For all my desire to be frenetically active, though, I think I'm better than many at feeling what I feel. I know how to be sad without being crabby or hurt without being mad. I've never felt bitter or angry throughout these nine months, by God's grace. I was quite depressed for a good 3 or 4 months, so I felt irrational sometimes. But, even then, I still had a good, basic grasp on reality. Reality being: God is real; God is good; God loves me; God wants to give me good gifts; God is zealous for his kingdom, and my salvation is an intimate part of that. Therefore, God often does hard things for us and even to us, out of a fierce love, to make us as he wants us to be. I know that all this is true because of the example of Jesus. He had THE hardest thing happen to him, total separation from God's love, and now he has the best and greatest position, the right hand of God. I'm so thankful that God is all those things because I'm very tiny and very helpless without him. Praying sometimes does it too, and that is the one other thing that I know is on the list today. I've been rather reluctant to get started, actually, because it probably is going to make me cry. I'm not so sure that I want to know what's behind door #1 today. I have a tendency to indulge my dramatic heart and sometimes I do get too worked up. I think that's where my sin is in all these feelings. I really want everything to be about me instead of being about glory to God for all that he does for me and the rest of his creation. I also worry WAY to much about what other people think about me. I feel continually judged for my feelings and behavior regarding this whole miscarriage thing. I imagine people just waiting for me to please shut-up about it, so we can get back to normal, quasi-deep, but never disturbing, levels of intimacy. Brendan always tries to tell me that I'm wrong about that, and I'm sure he's right. But, it's hard for me to assume that other people have space and grace for me to keep talking about it if I need to. Most people get this weird deer-in-the-headlights aura about them if I mention anything. I also don't want everyone to think I'm crazy or can't get over it just because I still think and talk about it. I think that's my biggest frustration. I'm always worried that people assume the worst of me. It's hard for me to communicate that I really am ok; I'm not bitter; I'm not despondent; I'm not "dwelling on it." I'm just still interested and actually sort of enjoy thinking about the experience and how it has changed me. Each day that goes by builds new levels of healing, and insight, and hope, and excitement about how much better equipped I am now to face future trials, my own and other's, because of the tools I've been given and the armor that continues to form. And not bitter, old, crusty, hard-knock life armor, but an armor of faith, hope, love, and knowledge of the Truth. I felt this way for a long time after the ballet career obliteration too, and I felt equally then, as now, that people were sort of waiting for me to get over it when, really, that's not it at all. I'm just a big-time processor; it's not that I'm not "over-it;" it's that I'm still trying to milk every last bit of education from the experience. Along with gaining education from it, though, is a reliving of it, and that leads to deeper understanding of the loss which is hard and sad. I think most people see that part of what's going on without hearing (or maybe buying?) what I say about all the good that is coming from my processing. Then, my sin takes over and I start battling, if not out-loud then in imaginary arguments in my head, for my image. "Don't think I'm messed up!" screams my sinful heart. "I'm doing great, gosh darn it! Everyone should be impressed!" Ah, sin. It's not because of me that I can handle and sift through my painful experiences; it's because of God. He's the only impressive one around here. Well, speaking of processing, I'd say this post just helped me work out quite a bit. A good day for it too, Speck Day. After all, she started it! We got to have Monday together! Rib was off yesterday, so that was great. I, oddly, didn't have the day off. Rib came to watch me teach. It was the first time anyone watched me. My students enjoyed having a nice, handsome audience. On Saturday, we engaged in an interesting quest. I'll start at the very beginning, a very good place to start. I'd been feeling sort of oddly out of sorts and a little depressed. I thought I was just tired and emotional... which I probably was. But, I figured things out when I signed Rib and myself up for our birthing/early infancy class. I thought, "Wow, if Speck hadn't died [Baby #1], I'd be finished with all this by now. In fact, I'd be giving birth sometime really soon." Well, that explained some of my weird, free-floating angst. Somewhere inside I knew that my body ought to be up to something big. We figured out that Speck's due date would have been January 25th, this coming Friday. I thought I was crazy, but I talked to a couple of my imaginary-club members, other people who've had miscarriages, and I guess the following thought process is common. It goes something like this: Am I forgetting all about my first baby just because now I have a new one that's doing better? I don't want to forget Speck. I love Speck just as much, if not differently, as I love Spud. But, who cares if I forget Speck. Speck doesn't. Speck, I believe, is in Heaven with Jesus and does not need me to love her. But, I care if I forget. That baby changed my life. I'm pretty sure that baby's departure changed my personality. I learned things about God, and prayer, and me, and Brendan, and my friends that I might not have learned otherwise. And, I'm the mother of TWO children, not just my one baby Spudkin. It's all very strange to think about. So, I decided that I wanted to have something to commemorate Speck's due date and Speck, her tiny speck-sized self. An Ebenezer. God instructed many people to build things to help remind them of what he did for them. Not to mention, God himself is very into giving us signs and pictures to help us remember things about him. Rainbows, the Lord's Supper, circumcision, baptism. There are a lot. Thus, the quest began. I wanted to get baby rings for each of my children and wear them on a necklace. Well, for whatever reason most people at jewelry stores in Seattle are clueless about the entire concept of baby rings. In the south, it's common for people to get rings or bracelets for their babies to wear. I'm sure it isn't terribly safe, but there you have it. We went to Green Lake Jewelry Works to see if we could just have some little rings made for us. It was going to be about $200 to make one and about $300 to make two. That's crazy. I didn't want this thing to be a big expensive production. My gold wedding band was only $50, so I wasn't about to pay $200 to have that exact ring, just 3 times smaller. We decided to go with another option. Rather than something that I could add for each child, we chose to just get something that would be specifically Speck related. The January birthstone is garnet, so we ordered a tiny little gold ring with a garnet in the center for me to wear on my pinkie, next to my wedding bands. That was way cheaper and, I think, a more special way to remember my first little one. Rib and I had such a nice weekend together. I hate Monday, not because I have to work, but because he does! Friday, Brendan worked from home because lots of people from iLike were sick. We try to avoid germs as best we can these days. I love it when he works from home because then I can make lunch for him and get him tea. I try my best not to harass him, and I think I'm getting better at it. I just love having him around. I left him alone for a while to go mall crawl with Hannah and Kristen. That was fun. We felt like we were in high school again... nay, middle school. On Friday night, we went over to the Jensen's house and played our new version of Cranium with the Richards, Seitz, and Mark & Rebecca. That was fun, but I was SUPER tired by the end. Then, my nice husband let me sleep in the car and then put me to bed. It was good to see Seattle friends after being gone for so long. We saw Juno on Saturday night and loved it. It really reminded me (minus the teen pregnancy, snarky-ness, and lack of Christ) of falling in love with Rib. It's weird that teenagers can actually fall in love. I know they can, though, because we did, and so did most of our currently married friends. I enjoyed watching it, too, because I'm pregnant. All the little jokes about the crazy stuff pregnancy does to your body are much funnier when you're currently experiencing said effects. The little poignant moments all really stabbed me deep too, like watching the ultrasound. We then went to Trader Joe's together to get dinner stuff. Rib made really good chicken chow mein from scratch for me. So nice. Home Again, Home Again - Jiggity Jig! Well, we're back! I had a really hard time leaving my family. It gets worse every time. But, don't worry, Seattle. Pretty sure I'll never move back to Amarillo. Here are the promised Texas-trip photos. At the top there are Skeeter, best dog ever, and his favorite brother. Notice the return of the Footie Pajama t-shirts for round two of Meador Christmas with Brendan. This is me, looking spectacular on Christmas morning, very excited about my favorite stocking stuffer, PLINKS! Before a shower for Whit. They had to force me to dress up. I'm not out of jeans and t-shirt much these days! Bachelorette party. Whitney actually felt sort of ok at this very moment. Finished! I almost forgot to do that little tossing boquet, so it's tiny! Sorry it's sideways! Me and Whit. She felt sick; it was hard, but we made it through. Isn't her hair cool! Whitney and Dad. He did great despite all the emotion of marrying off his last daughter! Me watching for her to come down the aisle after I left her crying and hyperventillating. She was really stressed about being sick. I cried big and ugly as she came down. Fortunately, I had the prayer to pull my kleenex out of my cleavage and attempt to dry my eyes. Married! She did great... no puking or passing out! Dustin was super cute. Not a great pic, but this is the bridal party. Two preggers, one just had a baby, and one college roommate. They kept making us do these sassy pictures. Cute, I suppose. I like how Whit looks mad; I look like a freak; everyone else looks cute. Kind of blurry, but funny. Me toasting at the reception. Me being my chatty, junior hostess self. Dustin is tall! He did pretty good dancing. Rocking with my Dad's band, the Prairie Dogs. This was one of our favorite songs. Spud and I really cut loose. Whitney was about to leave, so my emotional stress was decreasing. We had done so much work all week; it was time for dancing fun! Made me miss all dancing friends! 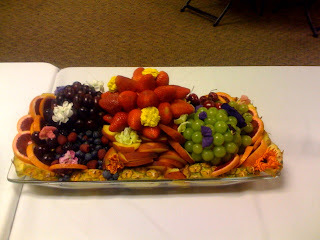 One of 3 centerpiece designs. Me with baby Micah. I love holding babies! And my hair looks cool too. Me, Amy, Micah. He did so great. It was his first outing! I planned a killer bachelorette party for this recent New Year's Eve. It was about as wild a bachelorette party plan as you can have when 1) all the guests are sweet, little, innocent Christian girls, 2) none of them are 21, and 3) those of us who are 21 are pregnant or recently gave birth. So, really, "wild" doesn't describe it at all. It was more like cute fun. Unfortunately, Whitney, the bride, has been fighting a lingering stomach bug since her lingerie shower and was feeling miserably sick all night. We wound up ending the party by toasting the New Year at 9:35. Then, Whit proceeded to barf all night. Poor Little-bit. The other craziness has just been last minute head-counting for the fancy, sit down dinner reception, coming up with a new cake topper, developing centerpieces for extra dinner tables, improving the other centerpieces, finding and scanning pictures for the slide show, and entertaining various sporadic out-of-town guests. It's all been really fun, though... well, except for Whitney being sick. That's been pretty unnerving. Meanwhile, Brendan is an amazingly helpful little trooper, and Spud feels like a million bucks. I've been really tired, but that is to be expected. My only other problem is my allergies. I've had several attacks thanks to cat people. I hate cats. I even had to take some Benadryl a few times. I know it's OK to take when you're pregnant, but I don't like it. I imagine Spud in there getting all groggy. I'm starting to actually show. I keep having these weird moments of looking down at my belly and thinking, "Man, I'm getting fat" only to quickly recall that there is somebody in there. When we get home, I'll post pictures from the trip and wedding, but here are my first belly pictures. I look like a mess in them, but you can see Spud really well.